Mark Hersam ('00 PhD ENG, '96 ENG) is part of the 2014 class of fellows, commonly referred to as "genius grants." The John D. and Catherine T. MacArthur Foundation today named its 2014 class of MacArthur Fellows, recognizing 21 exceptionally creative individuals with a track record of achievement and the potential for significant contributions in the future. Mark Hersam ('00 PhD ENG, '96 ENG) is creating new nanomaterials with potential applications in areas such transparent conductors and radio frequency transistors. 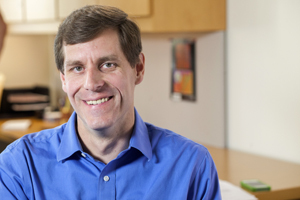 He is a leader in a competitive field, and takes an interdisciplinary approach to carbon nanomaterials by applying a biochemical research technique to a materials science problem. He is a professor at Northwestern University. Members of this year’s class join 897 other MacArthur Fellows whom the Program has recognized since it began in 1981. Fellows are selected through a rigorous process that has involved thousands of expert and anonymous nominators, evaluators, and selectors over the years. The Foundation does not accept unsolicited or outside nominations.